When it comes to volleyball knee pads, the Mizuno LR6 pads are among the most popular and highly rated. The LR6 pads incorporate minimalist design with maximum protection exactly where it’s needed. The small low profile construction allows for greater free movement and better overall flexibility when compared with bulkier knee pads. The following video produced by Mizuno provides a brief but informative overview of the LR6 knee pads. 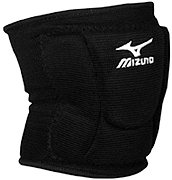 The standard Mizuno LR6 volleyball knee pads come in black and white. The LR6 limited edition Highlighter series offers a greater variety of colors from Shocking Pink with Diva Blue trim to Black with Lemon trim. Check out the various color options below. 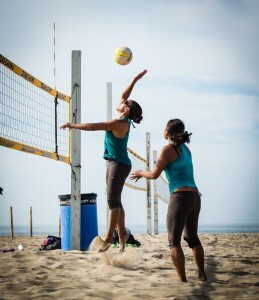 The greatest number of online reviews for the Mizuno LR6 volleyball knee pads can be found at amazon.com. 68% of the nearly 300 amazon.com reviews give the LR6 knee pads a 5 star rating. Additional online reviews are available at mizunousa.com and other popular online retailers like dickssportinggoods.com and eastbay.com. The pros and cons sections below highlight frequently mentioned positive and critical aspects of the LR6 knee pads. “Best knee pads I’ve owned” “Perfect fit” and “super comfortable” are statements that easily sum up the positive responses of hundreds of reviewers. Parents and even grandparents purchasing for their player children and grandchildren make up the majority of these reviews. Actual volleyball players at all levels and ages consistently mention how they love the low profile design, durability and second skin feel. Reviewers also made mention of the fact that the thin sleek look of the LR6 pads was a nice contrast to the often bulky, bubble and turtle shell looking design of other knee pad brands. Many of the reviewers previously used volleyball knee pads by Asics, Under Armour and Nike but are now exclusively using the LR6 pads for reasons already stated. A good percentage of the positive reviewers were repeat buyers. Aside from volleyball players, ice skaters, wood floor workers and even stock clerks have given the LR6 knee pads positive reviews relating to their respective activities. Sizing was the most common critical review of the LR6 pads. Nearly every critical reviewer either said “too tight” “too small” or made for kids, not teens or adults. It was recommended by numerous positive reviewers that the next size up should be ordered. For example, players who would normally do small or medium with another brand should go with medium instead of small or large instead of medium. Many of the larger framed players expressed disappointment at the fact that small, medium and large are the only available sizes. For these players, even the large was too snug and in some cases left red marks on one players legs after only wearing them for ten minutes. There is currently no extra-large option. Durability was an issue for players who dove or tumbled frequently during games. These same players report ripping, tearing and even melting of the fabric after sliding across the gym floor. Several reviewers recommend libero’s not use these pads because of the thinness and low profile; suggesting that there is not enough protection. In conclusion, it appears that the majority of all available online reviews have had a very positive experience with the Mizuno LR6 knee pads. Most of the critical reviews may have been different if the sizing range also included extra-large or bigger sizing options. 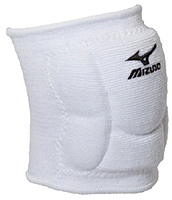 Mizuno LR6 volleyball knee pads are available through various online retailers and traditional brick and mortar stores that carry sports equipment. amazon.com typically offers the lowest online price for most of the products sold through their site. Returns are easy to process, free two day shipping with an Amazon Prime subscription or standard free shipping with a minimum order dollar amount.